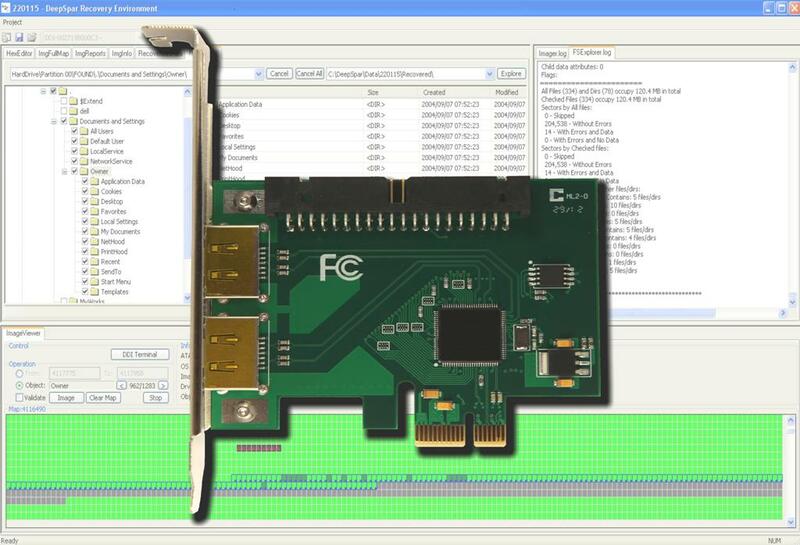 This hardware add-on is a PCIe card which provides extra ATA channels that can be used with the DeepSpar Disk Imager 4. If used for traditional 1-to-1 disk imaging, the extra channels lead to an increase of imaging speed of up to 20%. The two extra SATA and one extra IDE interfaces can be used to connect additional destination hard drives, allowing for simultaneous imaging to three HDDs, or parallel wiping of three HDDs. The most common usage of this add-on by data recovery companies involves using one destination drive which is larger than the source to hold all the user data along with imaging metadata (sector maps, head maps, etc.) and a second destination drive which is equal size to the source. If the imaging process goes smoothly and all data is retrieved then the second drive with all user data can be simply given to the client, saving a lot of time. If the imaging process is complex and file system recovery is required then the first destination drive containing the relevant metadata can be used.